Calling all aspiring film editors! This August and September 2016, the Film Development Council of the Philippines, in partnership with the National Film Archives of the Philippines and the Film ASEAN, will have a series of film editing workshops that will be held at all FDCP Cinematheques across the country. Students, cineastes, and young film professionals, who have the desire to tell stories through film, beyond the camera lens, are invited to join and, make the cut! 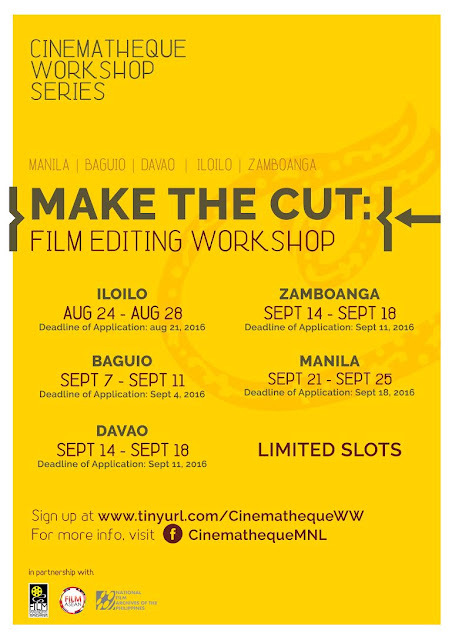 The 5-day workshops will tackle topics such as: A) the Power of post-production, B) File management and a more systematic workflow, C) Storytelling through editing, D) Non-linear editing techniques, and E) culminate in a presentation of students’ edited outputs. 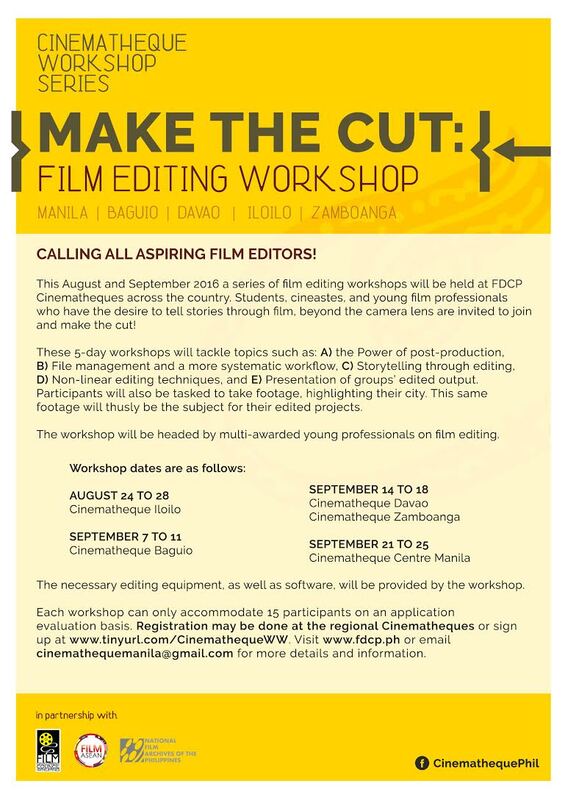 The workshops will be headed by multi-awarded professional editors. The course instructors include Abbie Lara, a seasoned editor for television (I-Witness) and documentary films in the Philippines; Zurich Chan, an independent filmmaker and film editor known for films Teoriya, Boca and Trails of Water; Bagane Fiola and Willie Apa, both known as seasoned cinematographers and active independent filmmakers (Sonata Maria); Tara Illenberger, a multi-awarded film editor and director with awards from Gawad Urian, Cinemalaya, FAMAS and many more; Carlo Francisco Manatad, an active film editor who works on various Filipino films and television series for ABS-CBN Network (The Trial, Boy Golden, Badil); and Charliebebs Gohetia, director of I Love You, Thank You (Honorable Mention, Rio Festival of Gender and Sexuality in Cinema). Deadline for submissions are 3 days before the respective workshop start-date (i.e. Cinematheque IloIlo deadline for submissions is on August 21, 2016). The necessary editing equipment, as well as software, will be provided by the workshop. Each workshop can only accommodate 15 participants on an application evaluation basis. The film editing workshop is the first component in series of workshops that will tackle different aspects of filmmaking, such as acting, make-up and prosthetics, and script-writing. Registration may be done at the regional Cinematheques or sign up at http://tinyurl.com/CinemathequeWW. Visit www.fdcp.ph for more details and information.